WHAT IS KAAL SARP YOGA ? 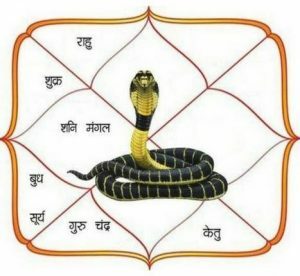 The Kaal Sarp Yoga is formed when all the planets are situated between Rahu and Ketu. Kaal means death. The person born under Kaal Sarp yoga/equation passes through death like agonies throughout the life. If all seven planets exist between Rahu & Ketu then it affects ones life badly. The person who takes birth in this yoga/equation suffers from various troubles like problems in progeny or having child, health, loss in business, family problems etc. Kaal Sarp yoga is more dangerous than other malefic yoga. Kaal Sarp equation affects a person till 47 years and some time throughout his life. It depends upon the position of Kaal Sarp yoga. If in a horoscope, partially few planets are outside the axis of Rahu and Ketu then it is known as Partial Kaal Sarp yoga.